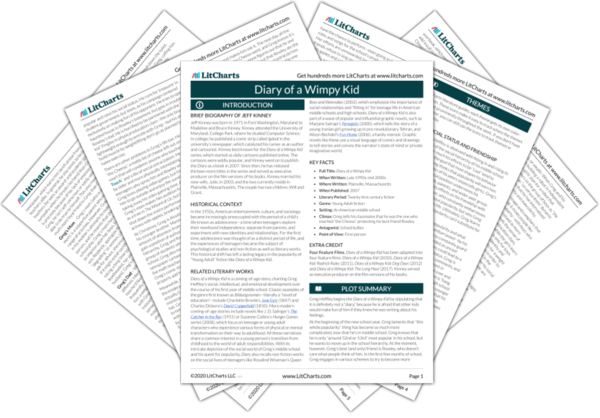 Instant downloads of all 942 LitChart PDFs (including Diary of a Wimpy Kid). 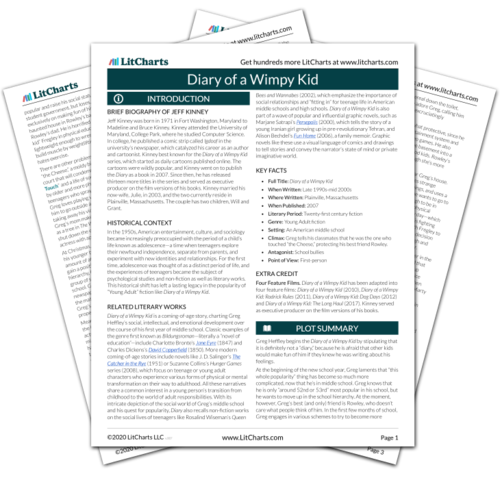 Welcome to the LitCharts study guide on Jeff Kinney's Diary of a Wimpy Kid. Created by the original team behind SparkNotes, LitCharts are the world's best literature guides. A concise biography of Jeff Kinney plus historical and literary context for Diary of a Wimpy Kid. A quick-reference summary: Diary of a Wimpy Kid on a single page. In-depth summary and analysis of every Chapter of Diary of a Wimpy Kid. Visual theme-tracking, too. Explanations, analysis, and visualizations of Diary of a Wimpy Kid's themes. Diary of a Wimpy Kid's important quotes, sortable by theme, character, or Chapter. Description, analysis, and timelines for Diary of a Wimpy Kid's characters. Explanations of Diary of a Wimpy Kid's symbols, and tracking of where they appear. An interactive data visualization of Diary of a Wimpy Kid's plot and themes. Jeff Kinney was born in 1971 in Fort Washington, Maryland to Madeline and Bruce Kinney. Kinney attended the University of Maryland, College Park, where he studied Computer Science. In college, he published a comic strip called Igdoof in the university’s newspaper, which catalyzed his career as an author and cartoonist. Kinney best known for the Diary of a Wimpy Kid series, which started as daily cartoons published online. The cartoons were wildly popular, and Kinney went on to publish the Diary as a book in 2007. Since then, he has released thirteen more titles in the series and served as executive producer on the film versions of his books. Kinney married his now-wife, Julie, in 2003, and the two currently reside in Plainville, Massachusetts. The couple has two children, Will and Grant. 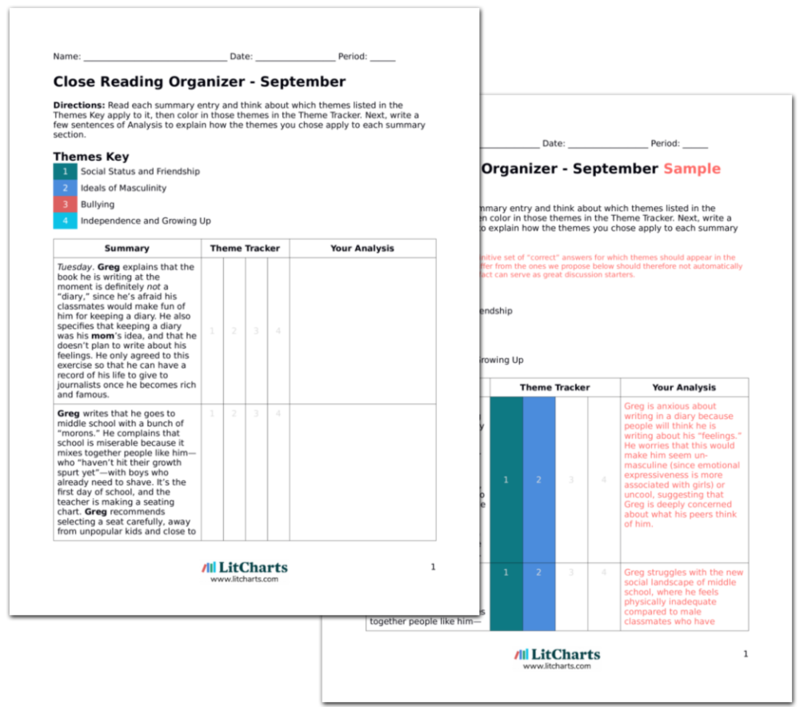 Get the entire Diary of a Wimpy Kid LitChart as a printable PDF. In the 1950s, American entertainment, culture, and sociology became increasingly preoccupied with the period of a child’s life known as adolescence—a time when teenagers explore their newfound independence, separate from parents, and experiment with new identities and relationships. For the first time, adolescence was thought of as a distinct period of life, and the experiences of teenagers became the subject of psychological studies and non-fiction as well as literary works. This historical shift has left a lasting legacy in the popularity of “Young Adult” fiction like Diary of a Wimpy Kid. Diary of a Wimpy Kid is a coming-of-age story, charting Greg Heffley’s social, intellectual, and emotional development over the course of his first year of middle school. Classic examples of the genre first known as Bildungsroman—literally a “novel of education”—include Charlotte Bronte’s Jane Eyre (1847) and Charles Dickens’s David Copperfield (1850). More modern coming-of-age stories include novels like J. D. Salinger’s The Catcher in the Rye (1951) or Suzanne Collins’s Hunger Games series (2008), which focus on teenage or young adult characters who experience various forms of physical or mental transformation on their way to adulthood. All these narratives share a common interest in a young person’s transition from childhood to the world of adult responsibilities. With its intricate depiction of the social world of Greg’s middle school and his quest for popularity, Diary also recalls non-fiction works on the social lives of teenagers like Rosalind Wiseman’s Queen Bees and Wannabes (2002), which emphasize the importance of social relationships and “fitting in” for teenage life in American middle schools and high schools. Diary of a Wimpy Kid is also part of a wave of popular and influential graphic novels, such as Marjane Satrapi’s Persepolis (2000), which tells the story of a young Iranian girl growing up in pre-revolutionary Tehran, and Alison Bechdel’s Fun Home (2006), a family memoir. Graphic novels like these use a visual language of comics and drawings to tell stories and convey the narrator’s state of mind or private imaginative world. Climax: Greg tells his classmates that he was the one who touched “the Cheese,” protecting his best friend Rowley. Four Feature Films. Diary of a Wimpy Kid has been adapted into four feature films: Diary of a Wimpy Kid (2010), Diary of a Wimpy Kid: Rodrick Rules (2011), Diary of a Wimpy Kid: Dog Days (2012) and Diary of a Wimpy Kid: The Long Haul (2017). Kinney served as executive producer on the film versions of his books. Houghton, Eve. "Diary of a Wimpy Kid." LitCharts. LitCharts LLC, 31 Jul 2018. Web. 11 Dec 2018. Houghton, Eve. "Diary of a Wimpy Kid." LitCharts LLC, July 31, 2018. Retrieved December 11, 2018. https://www.litcharts.com/lit/diary-of-a-wimpy-kid.